Countdown to “Shadow Study:”Maria V. Snyder Fan Questions and Answers! Click the above cover image, for the forthcoming new novel in the new Study Sequel Series- Soulfinder Trilogy- mysteriously titled Shadow Study!! Since I re-read Sea Glass a number of months ago, I cannot recall any significant details of the plot, so I will instead be moving forward with a thorough examination of Spy Glass instead next Wednesday. In the intervening weeks until the release of Shadow Study in late February, I will be discussing three of Maria V. Snyder’s novels- Inside Out, Outside In, and Spy Glass– beginning next week. All throughout these next few Maria V. Snyder Wednesday blog features, there may even be a special giveaway for those that are following these posts on a weekly basis. I have no inkling about just what the contest will involve, but it will most likely involve a Rafflecopter app. of sorts, and winner will be chosen at random. More details about this hypothetical giveaway to appear on a future Maria V. Snyder/Countdown to Shadow Study blog post. 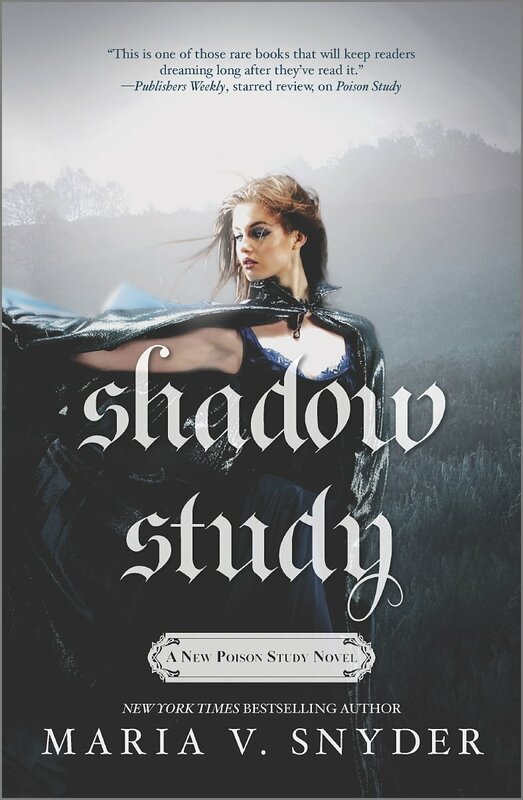 Having been a fan of Maria V. Snyder’s novel for almost six years, I cannot wait to share in the excitement, which will be ushered it right around the time of the advent of Shadow Study’s release (For those wanting to know the exact release date, it will be released February 24,2015!). One of the upcoming features for this virtual blog countdown will be continued examinations of all the remaining books in the Maria V. Snyder library of book releases. Since I have neglected to do a detailed examination of Sea Glass, I will be commenting on certain subplots and elements of Sea Glass, when discussing Spy Glass next week, so there will definitely be ample discussion of Sea Glass, when being discussed alongside Spy Glass. For now, I wanted to thank everyone that contributed questions for Maria V. Snyder last summer during the initial Maria V. Snyder Wednesday blog feature, where I requested any questions that you had for Maria V. Snyder, who would then answer them in due time! Recently, she has sent me her answers to all your questions, and they are all provided below. I put your names in bold-face font, enabling everyone reading this post who posted a question to easily find their answer from Maria V. Snyder herself!! Maria V. Snyder: Right now I don’t have any plans to write more books about Avry and Kerrick. However I won’t say never, I might get a great idea for another book in the future. (2).Natalie Bejin– When do we get to see the revamp covered (cover) of the first Study trilogy? Maria V. Snyder: I’m planning on posting them on my author page on Facebook soon. Unfortunately, they won’t be printed on the books until after the others are sold out. (3). Alice Vellender-When you approach a new book which aspect do you imagine first, the characters, the setting or the storyline? Where does your inspiration come from when choosing character names? (4).Jo Harman: Maria puts her characters through some real emotional trauma but has made them strong enough to handle it. Where does Maria herself draw her emotional strength from and has any of her characters’ story lines really affected her as she writes them? Maria V. Snyder: I’m not sure where I draw the emotional strength from. My characters have certainly suffered more than me. I think it might be a combination of two things. First, I took acting classes and acted in a number of plays so that helps me to “become” my characters while I’m writing and see the world through their eyes. Also when I was in middle-school (grades 6 to 8) I was the target of bullies and, while it was terrible, I survived and I believe the experience gave me the strength to look at any difficult problems as temporary – something that I have to deal with, but that I know will eventually be solved. It gave me a “never give up” mindset, which is what my protagonists tend to have as well :). (5).Anna Dokuchaeva: I understand that you write in a created world, but if it were real, what time period would the study books be in? Maria V. Snyder: I can’t really put a time period to my stories. Some people say they’re “medieval” due to no electricity and no gunpowder or advance technology. However, women were treated like possessions back in the Middle Ages, and I can’t allow that! Also the language is very different and my characters speak with a more modern vernacular. If pushed, I’d say right before the industrial revolution only because of the tech. (6. )Stephanie Napoli: Will there be anyway to tie in the healers books and the study books together? Cause that’d be cool if both worlds collided. Maria V. Snyder: It would be cool, but they are two completely different worlds with different magic systems. (7. )Shannon French:In the Study and Healer series, Yelena and Avry’s romantic journeys are very similar. In the Glass series, Opal’s romantic journey is very different and involves multiple relationships. What made her different for you while writing her story and why was long distance not a problem for Yelena and Avry while it just didn’t work for Opal? Maria V. Snyder: When I first started writing the Glass books, Opal was a mini clone of Yelena – except for the names, they were exactly the same. I had to exorcise Yelena from my head and develop Opal’s personality. She’s an artist and looks at the world in a different way. Also she had been forced to trick Yelena and even though she shouldn’t have felt guilty, she did and that experience affected her self-esteem. As for her romantic journey, I planned for her and Kade to be together from the start, but Devlen would not go away. He kept showing up and causing problems and then his redemption couldn’t be ignored. Maria V. Snyder:I discover the story’s plot as I write. I usually have an idea of the beginning and ending of the story, but how I get to the end is worked out along the way. When I get stuck, I either write down my thoughts in the notebook I keep for each novel (the old fashioned notebook with paper! ), or I talk it aloud like you do. If anyone overhears me, I say I’m talking to the cat even if the cat is in another room (he has super hearing ;). PS: Thanks Jordon, you’re so sweet! (9.) Shannon: After Cahil drops Yelena off after the New Beginning feast she asks him what he meant by “oh my sword”, he said that he would tell her the next time they were fighting. I can not figure out the answer to this, it has driven me crazy for years! Love all of your work! Maria V. Snyder: LOL you’re not the only one to pick that up! When Cahil says that, he has just made the realization that Yelena’s powers are very strong and she might be a Soulfinder. He doesn’t want to scare her or argue with her about it so he was smart for once and kept his mouth shut :). (10.) Andrea: I love your books and have all that is in the series. I was wondering if you ever come to book signing in West Virginia? Maria V. Snyder: I’d love to come to West Virginia and many other states and countries. The problem is always time away from home and opportunity. Most of my events are close to home, but the ones where I travel are because someone or an organization has invited me (and some cover my travel expenses). For example, I’m going to Oklahoma City in May because the Oklahoma Writer’s Federation invited to speak at their annual conference. I tell readers to keep checking my appearances page as I never know when an opportunity arises and I’m invited to someplace new like West Virginia. Thanks again to everyone that submitted such great questions, and also for Maria V. Snyder for taking the opportunity to answer all the questions that I received here through my blog (or on Maria V. Snyder’s own personal Facebook Fan Page, right underneath the post she graciously shared about this blog feature). Stay Tuned next Wednesday for a thorough review/discussion of the last book in the Glass Trilogy:Spy Glass!